V227: American Duchess Silks Stockings Are Dyeable, Yay! Great news! For those of you who were asking, I did a little test yesterday, on a sample pair of our new silk stockings, to see if they would take dye. Let soak for about 10 minutes. Because our stockings are 98% silk, they'll take any natural fiber dye. Yay! I don't recommend trying to dye the red or blue stockings, just the white ones. The clock will remain black, of course. Think of the possibilities! Pink...green...ombre!? Have fun! 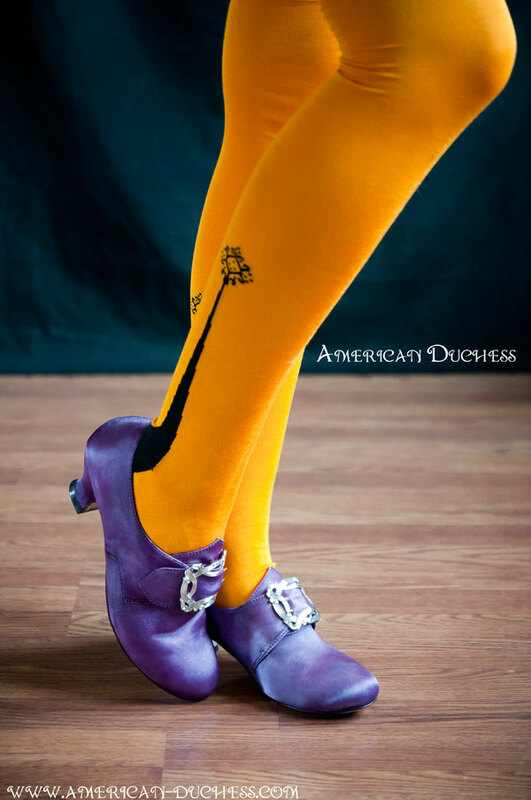 Buy stockings here - www.american-duchess.com. Get a discount when you buy two or more pairs, or one or more pair with 18th c. shoes. Just a note as someone who is a silk dyer, silk can be dyed by any dye that is designed for protein dyes (either wool, silk or nylon, generally). You are likely to have poor results from dyes designed for cellulose fibers (think cotton and rayon - generally the dyes used for tie dye). Enjoy the colors! Ah, interesting. I didn't know the difference. Thank you! Oh, my goodness! You are a rockstar! What frickin beautiful stockings and shoes! *virtual hugs* You are a girl with the ability and drive to make a thousand gorgeous costumes and have all the pretty shoes you could ever want. You win. Cheers to you, you fabulous lady! Oh, evil! These would be so great with the next project I'm planning, which is an Orange Halloween Polonaise, with either a Jack-o'-Lantern or Candy Corn stomacher, I haven't decided yet (http://costumeholic.blogspot.ca/2012/08/halloween-polonaise-pumpkin-or-candy.html). I was only going to buy 3 pairs, I hadn't thought of getting extras for dyeing. By the way, I love the purple Georgies! My vote is for the candy corn stomacher! mmm...candy corn. Now I can't wait for Autumn! Too COOL! I see you are sporting the news buckle, too. They look great. Which shoes are those and how did you dye them??? They are so stunning! !